This article provides a birds eye view of the differences between CRT and LCD computer display technologies. LCDs are much slimmer than their CRT counterparts. This slimness brings along a host of advantages such as space saving and portability. The viewable area is always about 0.9 - 1.1 inch smaller than the size specified on paper. This is due to the frame around the glass screen. So a 15" CRT would have only about 14" of viewable area. 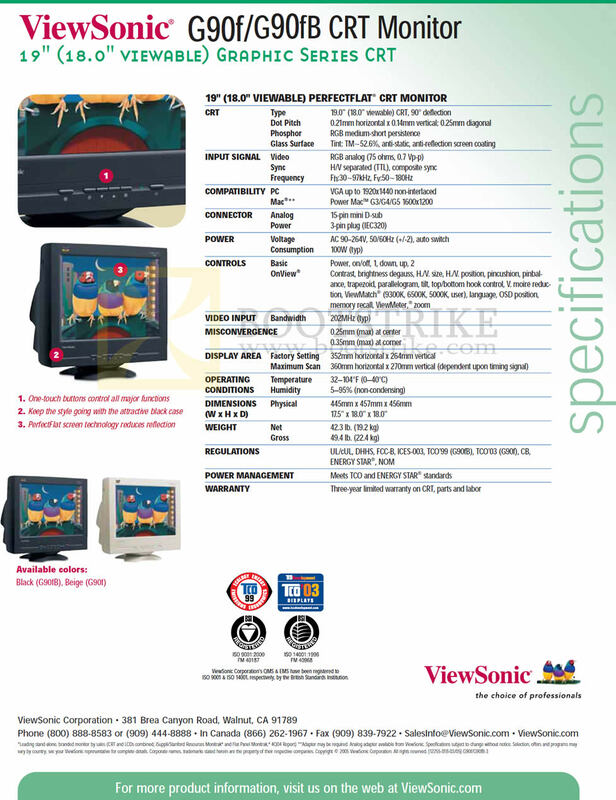 A 15 inch LCD always has a same size of viewable area as the specifications say. Larger displays may have their viewable area reduced by at most 0.1 inches. Many manufacturers tout true flatness for their CRT monitors, but the sad truth is that most are fake. In reality it is only the outer glass that is flat, and not the actual screen. The true 100% perfect flat monitors are the aperture grille tubes made by Mitsubishi and Sony. Even then, these tubes have a disadvantage - a faint thin line or two (Depending on size) running through the screen to stabilize the grill. Some people find this distracting, especially if you work on a light background (eg. documents) most of the time. CRTs emit electromagnetic radiation. Much of it is filtered by the lead heavy glass front and the rest that reaches your eyes are mostly harmless. Even then, radiation still passes through the screen and some people regard them as hazardous. LCDs emit a very small amount of radiation compared to CRTs. Health conscious consumers prefer them for this one reason. 17 inch CRT weighs around 16kg. 19 inch CRT weighs around 20kg. LCDs are very light, hence being portable. 17 inch LCD weighs around 6kg. 19 inch LCD weighs around 7kg. Higher power usage, more than 200% to an LCD of equivalent size. Glare is reduced by the use of special filters and treated glass. Hit the Auto button, and the display resizes to fit every pixel within its viewable area. If displaying a same image for a prolonged period, it could be embedded in the display permanently. LCDs are free from the burn-in issue that plagues CRTs and Plasma displays. However, they do occasionally have Image Persistence problems which can be fixed by switching off the LCD for an extended period of time. A minimum of 75hz is required for a flicker free image. All CRTs already support this, except at ultra high resolutions 2048++. LCDs do not "paint" their image. They provide a flicker free image every time. There is no such problem in CRTs as images are painted on the screen. LCD panels are prone to dead or stuck pixels (or dots) on the screen due to their manufacturing process. However, stiff competition has made many manufacturers adopt zero dead pixel / stuck pixel warranties for their products. CRTs already have a very fast response time hence this attribute does not apply to it. This attribute is specially for LCDs as the lower the response rate is, the better the chance of avoiding "ghosting" effect. Affordable and cheaper than LCDs due to their declining popularity. Considerably more expensive, but prices are dropping fast. Can be used at any resolution up to the maximum supported. No image quality is lost at any resolution. Must be used at its native resolution (maximum resolution) for best quality. Using the display at a lower resolution will result interpolation (scaling of the image), causing image quality loss. This is one of the major reasons for CRTs being in use by gamers as the high native resolution that LCD demands may not deliver smooth frame rates. 8-Bit max, 16.7 million colors. Narrow viewing angle, depending on technology employed. This document is Copyright(©) 2001-2008 by G.Ganesh. Visit Bootstrike.Com (http://bootstrike.com). 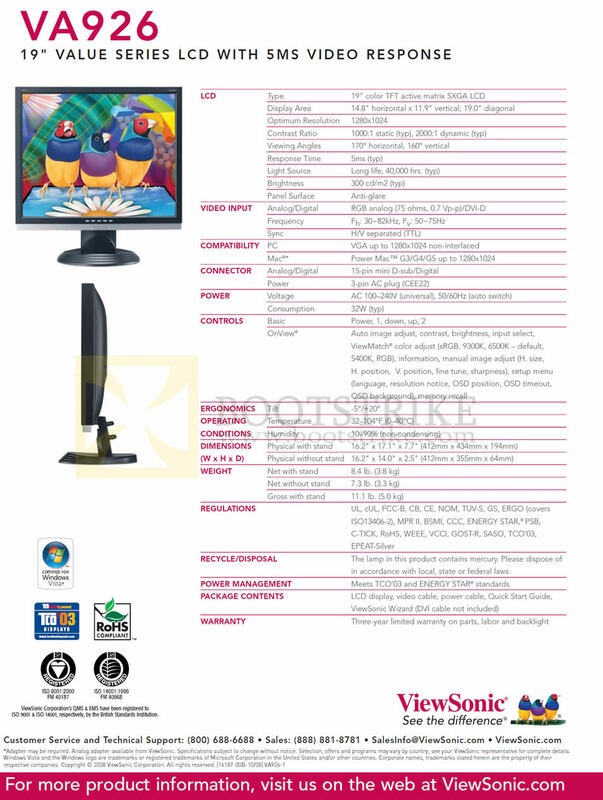 Figures were compared using a typical 19 inch LCD (Viewsonic VA926) and 19 inch CRT (Viewsonic G90F). Last Updated 1st Feb 2008. Unregistered I don't really like LCD's, I prefer Old CRT TV's because it works better with my VCR, and old video gaming systems, with LCD it has the VHS tapes have black bars at the sides and same with the video games. Ssame with my grandson (who is currently 12), so we switched back to our 25 inch CRT zenith Televison and everything went smooth, my grandson enjoys it too. Unregistered I have a CRT TV and used to have a LCD HDTV and I think I liked both but I had huge problems with an LCD TV because the screen broke easily and I called up to repair it but my warranty has expired and unable to repair my TV. So I bought another TV and its a Samsuck LED LCD TV and same sh*t happens again. So I give up and used my Old CRT TV left in the storage and I have no problems with this thing. So in conclusion I think CRT TVs are bit better then LCD but I liked LCD because it has HD 1080p and I can save up some space on my table to put stuff on it. Willy (1 posts) Seriously looks like a Windows bashing Linux, or visa-versa. Most of the facts where so outdated, at the time this comparison was written, that it isn't even funny. LCD only had 8bit color, in 2008? More like 16. But don't take my word for it, Google is your friend! Unregistered You should really make sure the comparisons at the bottom always list CRT on the same side, currently you're switching between left and right, which makes for a very confusing read. Fix that and it'll be much better. Unregistered Brainwash is right. LEDs have been here how long now, and the market has to pretend that LCDs and fluorescents are better than CRTs just to get the consumers to buy them so we have to buy them all over again in a LED solution? It's all part of a planned progression scheme. The fact is this: CRTs were the green solution, because unlike the LCDs, they only had to be manufactured ONCE to work for at least 30 years verses LCDs which I had to replace every three years. So typical for the baby-boomers to believe every bit of nonsense that's out there. By the way, I dropped my lap top 3" off the ground and the LCD broke! Meanwhile, I've hit my CRT television several times and it still works, it also was in a flood and still works, my house was broken into and it's still there: they couldn't carry it on their tweaker bike. Snoglydox (1 posts) LED and LCD are two totally different technologies; you need to do a lot more research. Unregistered In one table it says LCD gives a wide viewing angle compared to CRT, yet in another table it says the opposite. How can they each be both comparatively wide and narrow? I just don't get it, so in fact is the last table totally wrong? an unbelievable error! Is a LCD viewing angle wide? please can anyone answer yes or no from the tables. Unregistered Learn how to read. "Last Updated 1st Feb 2008". Of course information is NOW incorrect. Stop skim reading and ignoring BOLD words you tools. Unregistered Lots of these are untrue: 1st- Power consumed- Yes CRT can take more current at startup but it consumes as much or even less power than LCD when in darker scenes. LCD's lamps are always on and therefore consume the same current all the time, while CRT fluctuates. 2- 'Image sharpness is less than LCD' This is untrue. A CRT monitor can be much more sharp than a LCD monitor, and that at all resolutions supported. This all depends on CRT quality... and these days CRT quality is poorer and poorer with low tube quality control. 3- Radiation- You'd be surprised at how much real radiation is being output. Using a detector.. you have to be at 1 inch of the screen to detect radiation.. just by comparison the detector detects a microwave running at 20 feet. SmackBob (1 posts) No one adopted a 0 dead pixel policy. A summary of inquiries for most manufacturers can be viewed on intend dot ro, bottom RMA, then TFT somewhere on that page. Only a select few have a 1 pixel tolerance, the rest no RMA unless it's over 3 dead pixels. Unregistered Without the lcd, we would have no laptops. My father was working on a computer in a suitcase back in 1981 and I said what will you use for a monitor, he said "These will be for businessmen and they will plug into a pay monitor at airports or wherever they will be installed". I said to him that It'll never fly. What his idea was, is the modern laptop computer, if it weren't for the monitor issue he could have died a billionaire. The CRTs are usually considered to be 24bpp (8 bits for each RGB component), and most of Tthe LCDs are 18bpp (only 6 bits per RBG component).